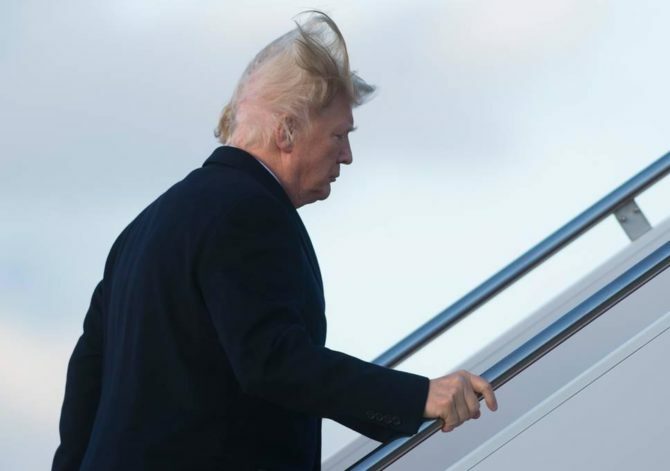 So the other day Donald Trump was boarding Air Force One when a strong gust of wind whipped across the tarmac. His intricate combover came undone. It was a deeply unsettling moment for everyone who witnessed it. Since the horrific video began circulating, the Internet has been having a collective outcry for mercy. Meanwhile, memers have been having a field day. Normally a President ages the period of four years. Trump looks ten years older after one year. It has to be all those late night twitter attacks, 12 can a day diet cola habit and a KFC buckets that are causing him to age even more rapidly. He’s apparently losing his hair too. If Mueller doesn’t work faster, the aspartame and grease will do the job. *Over the period of four years.